“Water! Water! Water!” wrote an early surveyor of northwestern Ohio, “tall timber! deep water! Not a blade of grass growing or a bird to be seen50.” The surveyor was traveling in the Great Black Swamp, a forty mile (64 km) swath stretching from the western end of Lake Erie nearly to Fort Wayne – an area as large as the Everglades, at its former natural extent51x52. But unlike the Everglades, much of the Great Black Swamp was covered by broad leaf trees53. Great oaks, elms, ashes and others formed a thick canopy that kept the forest floor in darkness. For most of the year the land lay in water, or ice, and for the summer in black muck. At the last of the Ice Age, the Wisonsinan Glacier worked to create this water-holding area54. The glacier built up ridges around its edges, and left behind a lake, which in turn left behind the thick layer of clay at its bottom. The ancient lake also left its beaches as sand ridges, that Indians later used to cross the swamp. While crossing, one might have seen some of the plentiful wildlife, such as boar, bobcat, black bear and timber wolf55. Just northwestward of the swamp ran the Maumee river, where the Indians dwelt amid bountiful fishing and hunting, and fertile lands that they turned into great corn fields56. After the press of westward settlement, and the U.S. Army, drove out the Indians, the government fashioned a road through the Great Black Swamp to the land of milk and honey beyond. “A bank of muck and mud twenty feet wide and about three feet high was build mostly by Ox Power,” wrote a dweller, C. H. Opperman, of the Maumee and Western Reserve Road (now US 20)x57. “Nearly all … who took the swamp route regretted their unwise decision, for many of them had ox teams to draw their high-wheeled covered wagons. Often the Oxen would sink to their bellys and the wheels to the hubbs and in many cases made only a mile or two of progress in a day.” So 31 inns rose to stand along the 31 miles of road and aid the slow moving pioneers58. Some men would claim a mud hole and charge money to pull wagons out of it. One traveling pioneer spent his life savings of $100 on getting pulled out of mud holes. So he stopped and staked out his own mud hole, and made his money back before he carried on. In 1840 the Great Black Swamp stood at its last years of full glory. From then on more settlers came in and cut down trees, and some dug ditches to drain water off their land – often on to their neighbor’s61. After a big outbreak of the waterborne disease cholera, the Ohio government in 1859 gave counties the power to seize land for more effective ditching. When farmers found that surface ditching left their land still too soggy, some tried underground drains of loose stone, or of pairs of planks nailed into a “V” and laid open end down. These underground drains did not work nearly as well as clay tile, but it was too costly to bring clay tile in. Then in the 1860’s, after someone discovered the bed of clay under the topsoil, many drainage tile factories arose. The factories’ kilns were fed by the swamp’s clay and fired by the swamp’s trees. And by 1900 the kilns’ product had drained and dried the Great Black Swamp. In its place lay fine farmland, with crops growing on a 10,000 year-old compost heap. The Everglades historic boundary is marked here by the yellow line. It includes the area of sheet water flow from Lake Okeechobee to the sea, and excludes some adjacent wetlands. The Great Black Swamp was Ohio’s largest wetland. The swamp was once 120 miles long and about 40 miles wide. In 1859, the “ditch law” was passed to allow the installation of pipes to drain the swamp for agriculture and development. Today, only five percent remains in scattered areas throughout northwestern Ohio. … the historical Everglades that once extended over an area approximately 40 miles wide by 100 miles long, from the south shore of Lake Okeechobee to the mangrove estuaries of Florida Bay. 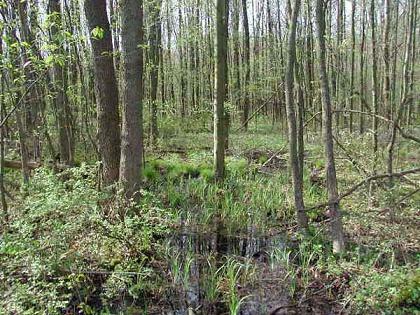 For thousands of years much of northwest Ohio lay covered by a vast, luxuriant swamp. According to early observers parts of it were watery meadows, veritable seas of living, moving green that would undulate beautifully in a summer breeze. Other parts of it were majestic and untouched forests, cathedralesque stands of oak, sycamore and hickory trees that soared skyward and blocked out the sun. Still other parts of it were thick, impenetrable brush and wild growth. Its thousands of square miles spread over all or parts of 12 counties stretching east to west from Sandusky, Ohio to near Fort Wayne, Indiana and north to south from the Maumee River valley to near Findlay, Ohio. The sandy beach deposits rising above the nearly flat lake plains, especially in the region called the Black Swamp, in northwestern Ohio, captured the attention of Native Americans and European explorers and settlers because the ridges provided dry passage through the swamps formed on the former lake beds. hello. MY MADIAN NAME WAS JUDY A KEEZER…. FROM PAULDING COUNTY CECIL OHIO THE MIDDLE OF THE GREAT BLACK SWAMP….WOULD LIKE MORE INFO OF THE BLACK SWAMP…. MY FATHER WAS A PURE BRED SHAWNEE…. SO PLEASE COULD U GIVE SOME MORE INFO ON THIS TOPIC ……..COZ IT SEEMS LIKE YOU ALL ARE LEAVING OUT PAULDING COUNTY OF THE BLACK SWAMP….. The land is the most level of any county in the state, and plats look like a checkerboard, with roads every mile. This level terrain resulted in Paulding County being entirely within the Great Black Swamp, unlike any other. As someone from Michigan I find this to be a facinating article. It would have been wonderous to see the swamp in it’s original glory and wildlife! Well written by the author. Kudos and thanks for a very interesting, well-written article about the Great Black Swamp! I had not yet seen the great map you posted; that was really informative. I will have to check out the Wood Co. Black Swamp Conservation and Restoration Area sometime (is it open to the public?) Your use of citation and bibliography are also admirable; I would like to go in and re-tool my brand-new blog (http://theblackswampcornucopia.blogspot.com/) a bit to similarly city with appropriate bibliography. In it, (among other things) I am attempting to show high-resolution photo examples of early U.S. coins paired with events from contemporaneous year-matched U.S. history, especially focusing on NW Ohio and the Great Black Swamp region. I will link to your blog in the near future. I like your blog’s concept of pairing old coins with Black Swamp regional history — you don’t find that anywhere else. I also like the writing and material — it’s good, interesting content. I have added Black Swamp Cornucopia to the blogroll at The Paragraph. I am planning to tour the patch of Black Swamp primeval forest at Goll Woods, where we have 400- and 500-year-old trees. I didn’t make it in August as I had planned, but may shoot for spring, before the mosquitoes come out. Thanks so much for stopping by and for adding my fledgling blog Black Swamp Cornucopia to your blogroll – it’s an honor. I’ve likewise added The Paragraph, with its very well-written and engaging content, to the Blogger “My Blog List” on my site. Thanks also for the tip about and the link to Goll Woods. I will be sure to make the trip with my wife and 8-year-old daughter next time we are in the Archbold area. Truly amazing that such a decent-sized tract of virgin timber still remains from an era preceding the first European footprints in the Great Black Swamp! Goll Woods was not part of the Black Swamp. It is either in Williams or Fulton County between stryker and Archbold.